Stitchtite is known for its lovely colors. Those colors can range between pink to lilac to deep purple. Stitchtite was first discovered in Tasmania, Australia. 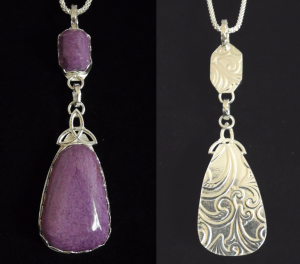 This pendant is unique in that it is a double drop — two Stitchtite stones. Note the unique pattern that I have embossed into the rear of the Sterling Silver setting. The lower lower stone is topped with a Sterling Silver Celtic knot. This necklace is accompanied by an 18 inch Sterling Silver Chain. $175.00 including free shipping within the US.